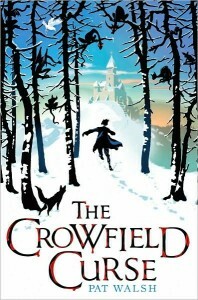 It is the darkest of the Dark Ages, and fourteen-year-old William is sent into the forest to gather firewood for Crowfield Abbey, the impoverished monastery where he has lived since becoming an orphan. While there, he hears a plaintive cry for help and investigating, discovers a strange creature caught in a trap. The first thing he saw was a pair of large green eyes, flecked through with splinters of gold. The eyes stared back at him warily. Then he saw a small, pointed face, the skin as brown as a beechnut, pointed ears that ended in tufts of reddish brown hair, and a small, skinny body no bigger than a cat’s. A long, thin tail curled and uncurled around the body. He was a creature the like of which William had never seen before. The injured creature is a hob, a magical creature who refuses to give William his name, lest William gain power over him. William sneaks him back to the abbey so that Brother Snail, the crippled monk who is a healer, can help him. William is surprised to discover that only he and Brother Snail can see the hob, and even more surprised to discover that there are deeper secrets about—mysterious visitors who arrive in the middle of the night, a strange creature secretly buried in the forest, and always whispers (but nothing else) about an ancient curse the abbey is suffering under. Will must act quickly—to save the hob, to save the abbey, and to save himself, a task made all the more dangerous because nobody is who they seem to be. When I was ten or eleven years old, I brought home from my school’s library a hardcover book with an intriguing cover illustration called The Satanic Mill*, written by a German author named Otfried Preussler. It was an alluring tale of medieval dark magic, with action and suspense in all the right places, and an ending that took me completely by surprise. As I recall, the denouement was almost non-existent: just a paragraph or two, leaving me satisfied and yet longing for more. In all the years since, I have been looking for a book that would evoke the same sense of wonder and awe and be a worthy accompaniment to it on my bookshelf. I have read plenty of books which take place during the middle ages, and plenty which invoke some form of magic, but what I found so appealing about The Satanic Mill was how that magic was presented: it wasn’t simply old vs. new magic (think The Lion, the Witch, and the Wardrobe), or magic vs. non-magic (think Harry Potter), or even good magic vs. evil magic (again, think Harry Potter, plus just about every other book that invokes the m-word), but layers upon layers of magic. Just as you discover what a character is about—what they know and understand, and how they came to know and understand it—you discover, as do the characters you are reading about, that there is an even deeper layer of magic at work there. This discovery comes as a surprise: a shocking one to the characters and a pleasant one to the readers. This sort of deep magic is hinted at in the early volumes of the Chronicles of Narnia, although this idea is fairly well explored in The Magician’s Nephew. (If there is a fault here, it is that the new editions of this series place Nephew as the first book in the series, rather than the penultimate. This may be the order C.S. Lewis preferred, but he is in effect showing us where he hid the rabbit before he pulls it out of the hat, at a great loss to newer readers.) It gets hinted at in Harry Potter, although Dumbledore gets killed off before he gets a chance to explain it fully to Harry, suggesting that we aren’t meant to understand it, and that doing so results in death—magic knowledge-giving apples, anyone? It gets a more thorough treatment in Rick Riordan’s The Lightning Thief, although the structure of Greek mythology makes this difficult to ignore—Riordan would have been a monkey to ignore it. He certainly does it in a more interesting way than a lot of his imitators do. In fact, the only fantasy series I can think of where this idea of deep magic is fully utilized as a story-telling device is J.R.R. Tolkien’s Lord of the Rings. However, when examining Tolkien’s life and career, what he pulled off with these books is the neat cartoon task of running off a cliff and floating in midair. Of course, in the cartoons, the character looks down and realizes he is floating in midair and falls because there is nothing supporting him. Tolkien’s genius was to put enough things in place—both visible and invisible—to keep his characters and stories, along with our disbelief, suspended. We see reflections and shadows and hear echoes in the dark, and know that there are layers and layers of magic and history behind the stories he tells**. Goodness, I think I’ve gone off on a tangent. What I originally meant to say was that The Crowfield Curse is a worthy successor to The Satanic Mill on my bookshelf. It some ways the books are remarkably similar: both are about boys on the cusp of adolescence, both take place in the Middle Ages or thereabouts,*** and both take place in fairly self-contained communities—an abbey in one case and a mill in the other. 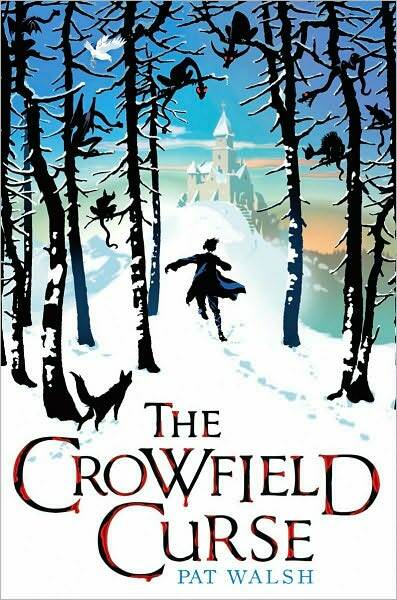 The Crowfield Curse is a worthy successor to The Satanic Mill is for me, not just because of its similarities, but because of its enthusiastic embrace of older, deeper magic. It will never be as good as The Satanic Mill for me, if only because The Satanic Mill came first and is therefore a touchstone for me, just as I can imagine The Crowfield Curse will (hopefully) become a touchstone for lots of children after me. *Because the United States is full of people who read book covers, but not the books themselves, I cannot begin to imagine how difficult it would be to market a book with this title to children and young adults today. The original German title was Krabat, which is, of course, the name of the main character. Because that title means nothing in English (a slightly more erudite US citizen might think it’s a book about ties), the English publishers and translators chose The Satanic Mill as its English title. That the book is actually about resisting and escaping the dark arts would mean nothing to such would-be censors, simply because they couldn’t be bothered to actually read it. The name alone would be enough to merit their condemnation. Such is life, although the loss is theirs. **Madeline L’Engle’s Time Quartet comes to mind here, but in tone, treatment, and relevance, it looks forward as much as it looks backward. While this would seem to place it alongside H.G. Wells and Jules Verne, it very much stands on its own—a unique accomplishment. ***The Satanic Mill takes place in the 1600’s but the location is rural enough that medieval thoughts and beliefs had yet to give way to the Enlightenment.